In Jaen I was staying right next to a school, Parroquial Señor de Huamantanga, Jaen, Peru. The English teacher there was happy for me to talk to her grade 3 and grade 4 students (age group 13-15). The students wore uniform which was in perfect order and also their behaviour outside the classroom indicated that this must be a good school. As expected, they seemed to have high ambitions matched to those in the private schools. I felt the management of this school and its religious beliefs had a great role in making this a good school which apparently was the number one school in the whole city. 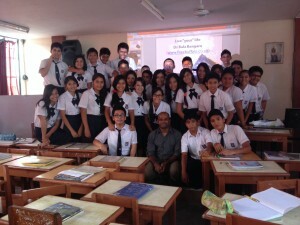 The students were hyper excited and after the talk they took to Facebook to declare their motivation in life. 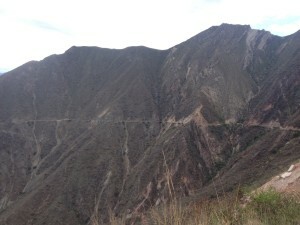 The road from Jaen to Cajamarca via Leimabamba was all paved and the route went through several tourist sites. In this section, apart from the pavement, what the Peruvian mountains had in store was something out of this world. 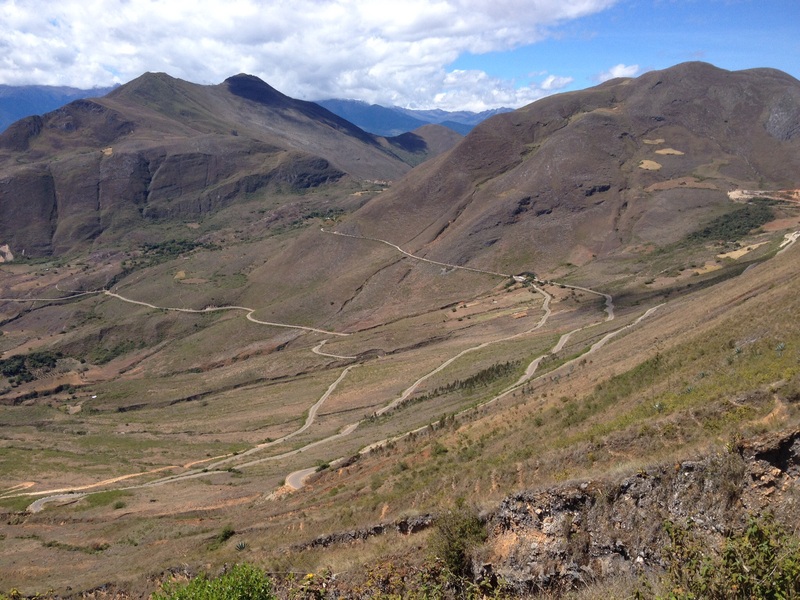 The road climbed up gradually alongside a river, so gradual that my legs hardly noticed the climb; about 2000 metres altitude gain over four days. The weather on the first day from Jaen to Bagua Grande was quite tropical where I could quench my thirst with juices from pineapple, sugarcane and watermelon. 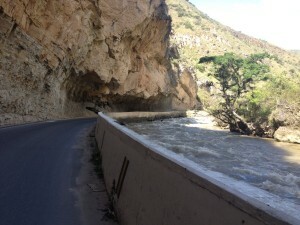 The second, third and fourth day were largely through a fantastic canyon whose walls have been carved to create road space at several sections. Traffic was very low which was a bonus and the only noise was that of the echo of noisy river from the walls of the canyon. change from the usual food that I ate on the road which was nothing but chicken and rice for breakfast, lunch and dinner. For some one whose taste buds were hypersensitive due to consumption of condiments over several years, the monotonous and unflavoured food killed my appetite at lest in the rural areas. Some good quality food and variety was the most important thing I looked forward to whenever I reached big cities. 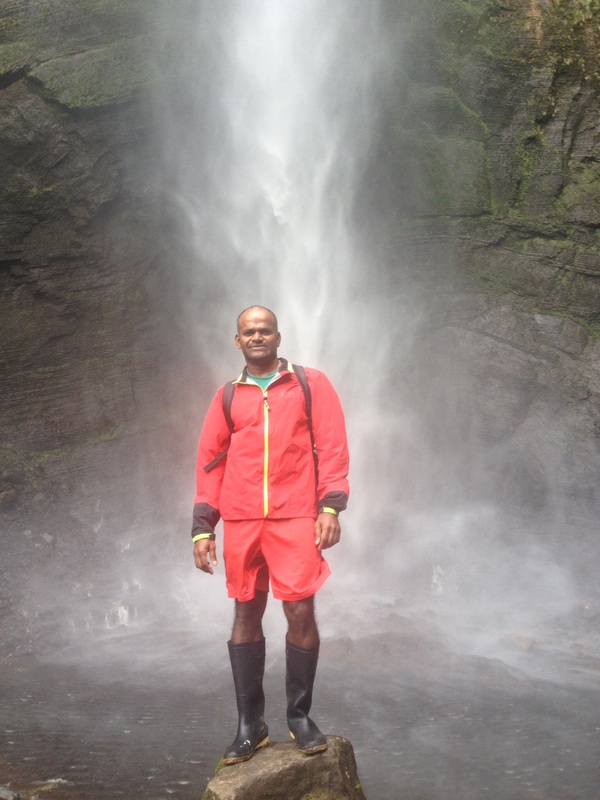 The two hour hike/walk through some rainforest to the Gocta waterfalls was a bit of a change for my leg muscles. Some claimed this was the third largest waterfalls but this has been disputed ever since. On top of this there were several mystical stories around this falls. Apparently it was only discovered in 2005. It was hard to believe that in 21st century we did not know about this waterfalls. I hope someone will put an end to all these stories at some point. Nevertheless the hike was worth it. The water dropped from so high that it became just mist by the time it reached the bottom. 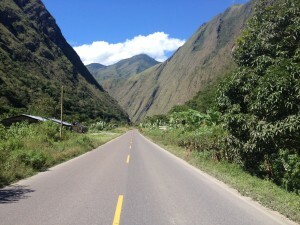 The road from Cocachimba to Tingo was a single lane road after the turn off to Chachapoyas. It was only a few metres wide like the country lanes in Cornwall. 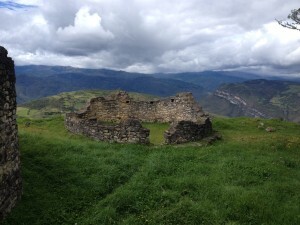 I camped out at a restaurant in Tingo for two nights in order to visit the Kuelap ruins. These ruins were located on top of the mountain with 360 degrees views. The Inkas must have been a fan of great views. At that time, it was believed, there were about 500 round house within this fortress arranged in two layers. The top circuit was reserved for the shamans and the elites! Tingo to Leimebamba was another lovely ride along some quiet roads. Since the road was quite narrow no big vehicles passed through these roads, perfect for touring cyclists. In Leimebamba there was a museum that housed the mummies from Inca times. 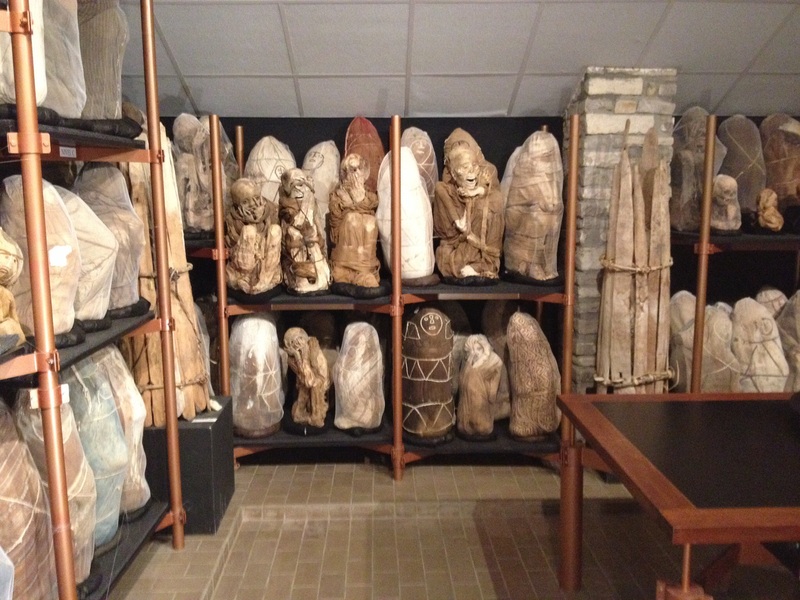 The museum did not interest me apart from these mummies perhaps because the information was all presented in Spanish. 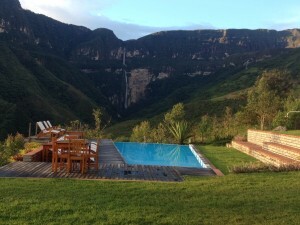 The next three days revealed the true nature of Peruvian mountains. 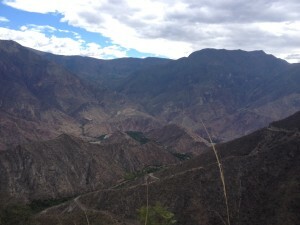 From Leimebamba to Le Balzas, it was a 30 Km’s climb from 2200 to 3600 metres first thing followed by a 60 Km’s descent to La Balzas which was at an altitude of 800 metres. This downhill was something I was looking forward to. It rained during the climb and on top of the pass I realised that my fingers were almost frozen. This I presume was due to the windchill. I needed my fingers to be flexible to use the brakes for the descent. From the top I could see the sun below and was keen to get down quickly. After about 15 kms from the top, which I managed with great pain, I spotted a house. I was not ashamed to ask for some hot drinks. The woman felt sorry that I could not even hold the coffee on my shivering hands and took me to her kitchen to warm up where she was cooking pork on a wood-fired stove. After 20 minutes I was ready for the road again. I felt the kindness from the poor had to be reciprocated so I left them with some money. The downhill was indeed lot more pleasurable when I was not shaking due to the cold. La Balzas was a small village nothing more than a street with few houses dotted along. The village in the canyon was so warm that mango trees thrive here happily, yet no houses had a fan, such was the wealth in this area. The place where I ate was a family owned restaurant which was also very basic. I spoke to few kids who hung out there. There was a 14 year old boy from the neighbouring village who lived here on his own, away from his family, because there were no roads for him to commute. He studied there in a school in La Balzas and worked part-time too. It seemed these kids were far behind compared to those in remote locations in the northern hemisphere. I read from BBC that there were 2.3 million children in poverty in the UK in 2015. I think the children from La Balzas would happily swap places with some of them. It would be a long essay to summarise my thinking on this issue based on my experiences and observations. Perhaps this is best left for another time. It is suffice to say, I was more concerned with the lack of opportunities rather than the poverty itself. 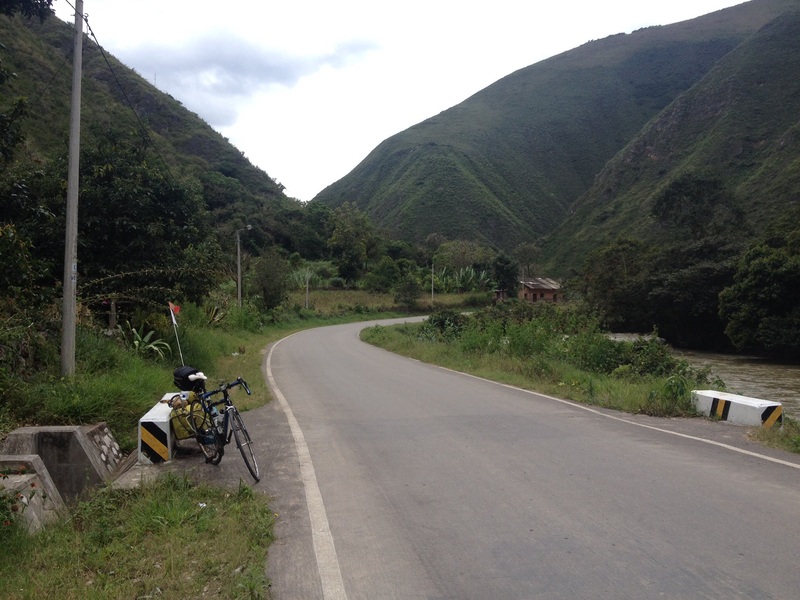 The relentless 42 Km’s climb that was in store after La Balzas, on my way to Celendin, was always at the back of my mind for the previous few days. I was as prepared as I could. The assault began at 6am and it took 8 full hours to reach the summit at 3100 metres. 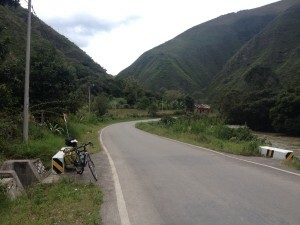 To my surprise I enjoyed the climb probably because the road was not too steep, the Peruvian roads were kind to cyclists the gradients were generally around 5%. However, the views from the road, overlooking the canyon with La Balzas at its bottom, does not change much throughout this climb. Once again the narrow roads were quite enjoyable. 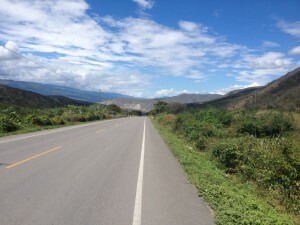 The final day was from Celendin to Cajamarca about 103 Km’s away. There was another climb from Celendin which was at 2700 metres to the top at 3700 metres over 50 kilometres. However, compared to the previous days climbs this one felt like a storm in the tea cup. At the top it was cold but no rain and the rest was mostly downhill to Cajamarca where I am at the time of this writing. This is a big city where I could find some good coffee too! Some route notes for future cyclists: The entire section from Jaen to Cajamarca via Leimebamba was paved. There was an unnecessary short climb of 5 Km’s about 20 kilometres before Pedro Ruiz that could be avoided. This could be spotted on google maps too. The new highway goes over a small pass but there was also an old road which was right next to the river, avoiding the climb and descent, and some locals confirmed this road. The trick is to stay just right next to the river, don’t stray away from the river. 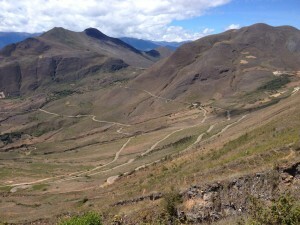 Chachapoyas was a bit of climb and it was not necessary for touring cyclists. Most tourists and backpackers go there to use it as a base to visit the Gocta falls and Kuelap ruins. Touring cyclists instead could get to these sites directly since these were just off the highway. Kuelap can be visited by hiking 12 Km’s or taking the 37 Km’s dirt road up the mountain from Tingo. There were two hospedajes in Tingo and it was not necessary to go to Nuevo Tingo which was up the hill. Leimebamba museum is about 5 Km’s from the town on the highway. Don’t believe the sign in the town which says 2.5 Km’s! The road from Leimebamba to Celendin was a narrow single lane but only small vehicles use this road and most drivers will warn you by honking. That was a tough route, but rewarding scenery! Well done on completing those huge climbs and the cold on the descents!